Do albatrosses really bring misfortune? Since Samuel Coleridge published The Rime of the Ancient Mariner, we've associated albatrosses (like this Black-browed Albatross ) with the superstition that shooting one would bring misfortune. 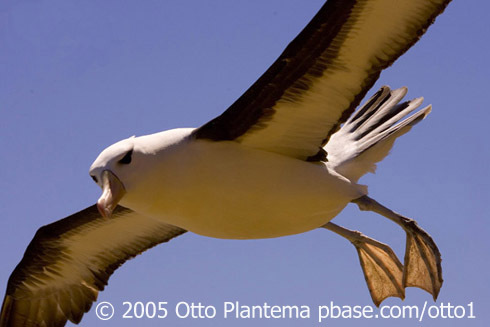 With a wingspan of up to 12 feet, albatrosses are among the world's largest seabirds. They come ashore only briefly, to nest. To hear the sounds of this Black-browed Albatross, search Cornell's Macaulay Library. Would you like to make a gift to BirdNote? Begin here. Since the early 1800s, when Samuel Coleridge composed The Rime of the Ancient Mariner, we’ve associated albatrosses with ships and superstition. For BirdNote, I'm Frank Corrado. Display call of the Laysan Albatross, as heard on BirdNote.org, is provided by The Macaulay Library of Natural Sounds at the Cornell Lab of Ornithology, Ithaca, New York. Recorded by Ernest S. Booth.